Banish brassiness with Joico Color Balance Blue Conditioner, a neutralising formula that works to colour-correct any overly warm, brassy or orange tones in naturally dark brunette hair with salon highlights or ombré. Working to nourish and protect every strand, the colour-restoring conditioner utilises a Multi-Spectrum Defense Complex to help fight fade, and a Bio-Advanced Peptide Complex to repair from root-to-tip, ensuring frizz is diminished and shine is illuminated. 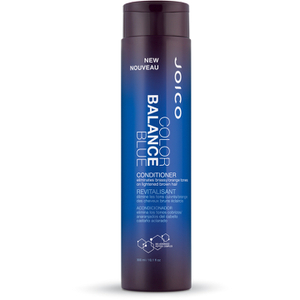 Its correcting properties help restore true colour to your highlighted or ombré hair, bonding to every strand to preserve 89% of your hard-earned colour for up to 8 weeks. Massage into freshly washed hair; leave on for one-to-three minutes, then rinse.